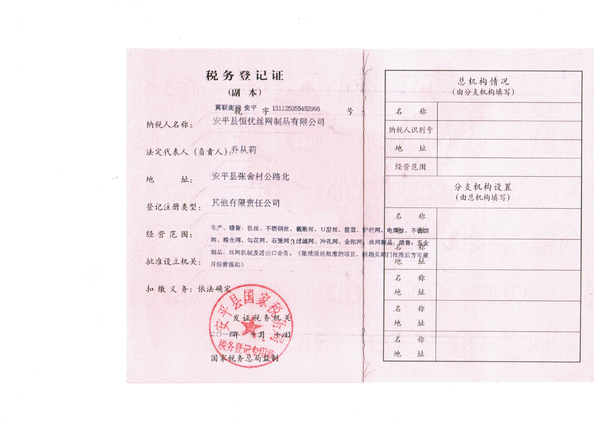 Anping heng you Wire Mesh Co., Ltd. was founded in 2008. It is located in the largest wire mesh manufacture base in Asia, Anping County, Hebei, China. 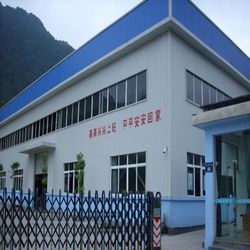 It has become a big comprehensive wire mesh company which is engaged in domestic and foreign trade. Our products are sold well throughout the world, such as USA, Germany, Italy and Southeast Asia etc. 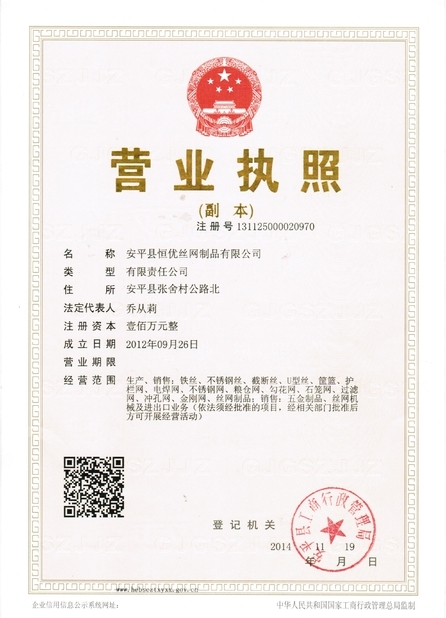 Thank you for considering Anping heng you Wire Mesh Co., Ltd. We want to be certain that your hard-earned dollar is well spent. We try to provide products with more variety, good quality, reasonable price, timely delivery and reliable after sales services. It is the target of hneg you people to meet customers’ requirements and to satisfy our customers. 1> chain link fence . 2> barbed wire and razor barbed wire . 3> hexagonal wire mesh or chicken wire mesh . 4> storage fold cage . 6> welded wire mesh panel and holland wire mesh . 8> stainless steel wire mesh and dutch weave wire mesh . 11> chain link fence . 12> galvanized window screen and aluminum window screen . 13> stone cage mesh or gabion wire mesh .